Still doing Fistic History, still using Title Bout 2.5 (despite the newer version 3.0 being relased). EDIT, 7/21: I’ve had to abandon this project due to an non-correctable error. I accidentally resumed play in 1922 as opposed to 1921, and didn’t realize it until I was deep into the year. I guess that gives me an excuse to get 3.0 after all. A big change comes to PPU for the start of 1905: the play-in box offs to determine the contenders for the next year will decided in a format called Contenders Road. Each year starts with the 24 highest ranked boxers in each weight class randomly squaring off in April in the first round. Winners advance, and in the event of a draw, the LOWER ranked fighter advances. In August, the 12 winners then face off randomly in round two. Then in December, the six survivors square off once more in the final round. The three survivors fight for the title of their respective weight class in the ensuing year. 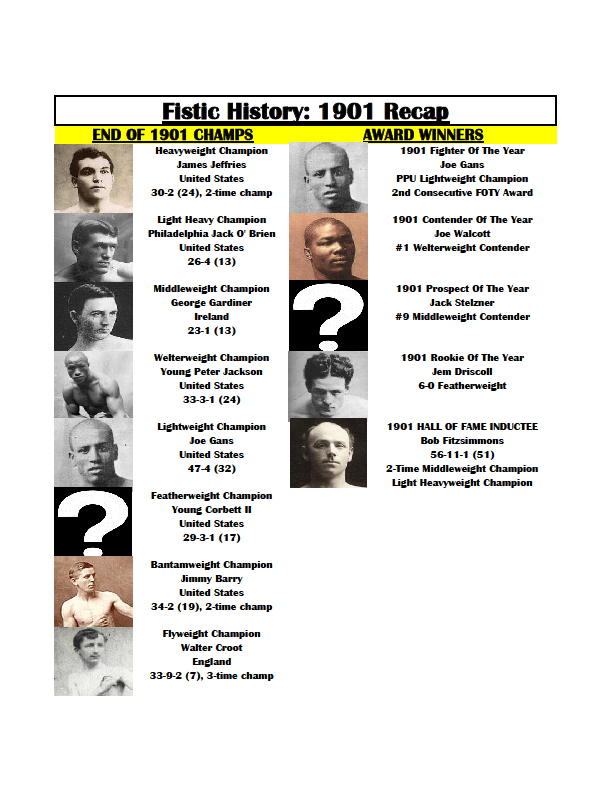 Fighter Of The Year: Joe Gans — Despite a loss in a title vs. title fight to welterweight king Joe Walcott, Gans has made 15 straight defenses of his lightweight title without a loss. 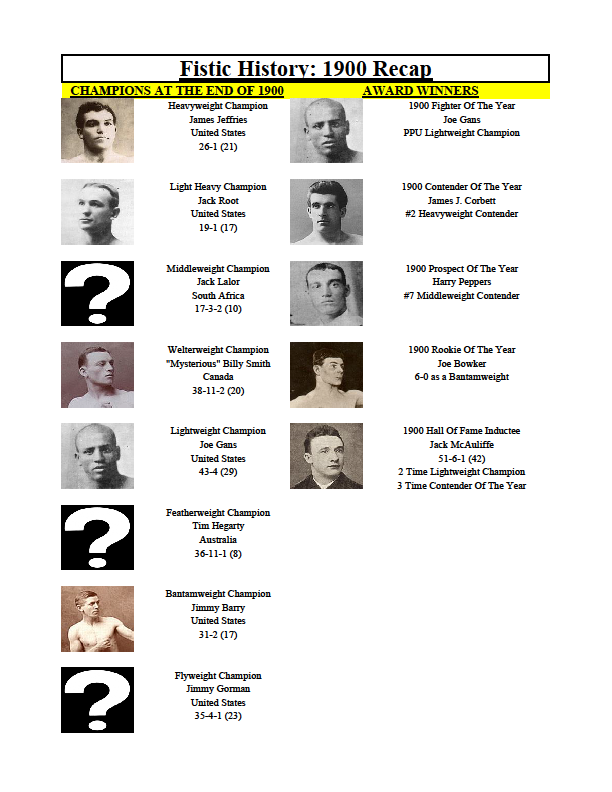 Contender Of The Year: Joe Walcott — Many think the #2 welterweight contender is just about washed up after his loss to Battling Nelson in Denmark. But with a record of 61-7-1 with 47 KO’s, the Barbados Demon may have a few fights in him still. Prospect Of The Year: Tommy West — The Welshman is currently #10 in the welterweight class, wins enough to get close, but losses in critical moments has haunted him from a shot at the gold. Rookie Of The Year: Frank Klaus — 6-0 as a middleweight, his last five wins were stoppages. HALL OF FAME INDUCTEE: Jack Dempsey NP — Finished his career at 55-12-1 with 30 KO’s, and was a four-time middleweight champ.